This is my new favorite recipe. To be honest, we actually had it several weeks ago and I've been holding out on you. Not purposely, of course, I just had quite a backlog of recipes to share! Now that it's here, will you promise to make it soon? I don't think I've had refried beans since I've been to Taco Bell. And I don't think I've made a stop at Taco Bell in years. I'm okay with that, since my main draw there were the cinnamon twists, but I'm ready to welcome refried beans back into my life! I'm loving finding ways to enjoy Mexican food that doesn't have me wanting to unbutton my pants at the end of the meal. 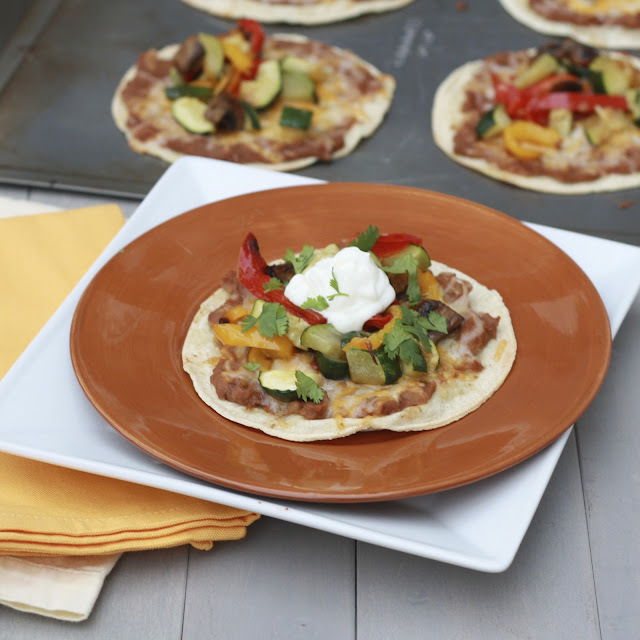 Plus, you can't feel guilty when your tostada is piled high with roasted vegetables! To make this dinner even simpler, I roasted the vegetables one evening and then refrigerated. The next day when we were ready to eat, it took all of fifteen minutes to get the rest of the meal thrown together (I just reheated the veggies in the microwave). We mmmed our way through these the first night and actually opted to finish of the leftovers that Friday night instead of heading out to eat. I foresee this being a standby meal in our house! Did you enter my giveaway? Enter by tonight for a chance to win! 1. Heat oven to 450F. Line 2 rimmed baking sheets with aluminum foil. Toss vegetables with 2 tbsp olive oil and spread over prepared baking sheets. Sprinkle with salt. 2. Roast, tossing and rotating baking sheets halfway through, for 25-30 minutes, until vegetables are tender. Transfer to a medium bowl. 3. Remove foil from baking sheets and place tortillas on them. Brush with remaining tablespoon of oil and spread refried beans on each of them. Sprinkle with cheese and bake for 5-7 minutes, until the beans are warm and the cheese has melted. 4. Top tortillas with vegetables and serve with sour cream, cilantro, and hot sauce, if desired.